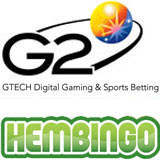 This week, Swedish media company United Media was the first to launch on GTECH G2’s vastly improved Bingo 2.2 network with their Hem Bingo site (www.hembingo.com). G2’s Bingo 2.2 software upgrade, unveiled this week at EiG in Copenhagen, incorporates a suite of mini games that provide a supplemental revenue stream for bingo operators. Bingo 2.2 allows clients to pool liquidity and maximizes the jackpots in the bingo rooms through its linked games and multi currency functionality. In addition, it offers a fantastic suite of multi lingual mini games launching from the game window including mini progressive slots, table games, video poker and scratch cards. The Bingo software and mini games portfolio will be updated quarterly with innovative new feature functionality, to ensure that G2 Bingo remains at the cutting edge of bingo front and back end development, catering to the needs of both the Bingo player and licensee. “In early 2010, we plan to merge Boss Media’s bingo partners with St Minver’s International Bingo Network to create one large combined network using G2 Bingo software and operated from our Bingo hub in Gibraltar,” said Alison Digges, Group Head of Bingo for GTECH G2. “Pooling the liquidity of over 80 bingo partners will make the GTECH G2 Bingo network one of the leading networks in 2010”. The European iGaming conference (EiG) in Copenhagen this week is the first time since lottery industry giant GTECH announced the creation of its new igaming division that the four companies acquired to form the group are exhibiting under their one new brand name, GTECH G2. Boss Media, Finsoft, St Minver and Dynamite Idea, now backed by the world’s leading supplier to the lottery industry, are showcasing their comprehensive, end-to-end solutions for igaming operators.